This is my Unity Stamp Company Friday Friends with Flair post. I'm still working in my mini journal from Faber-Castell Design Memory Craft. I used the back of another page that had some light stenciling on it and some splatters and marks from other projects on the page. 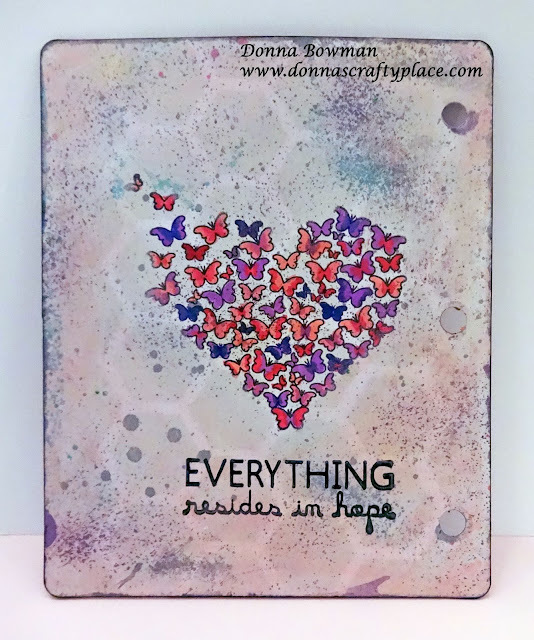 I stamped the Heart with all the butterflies in Archival Ink and colored all the little butterflies in with my Clean Clear Real Brush Watercolor Markers. I tried to blend in a few colors on the bigger butterflies. I wanted the heart to stand out so when I finished coloring it, I rubbed pink and white metallic Gelatos on the background to lighten it so the butterfly would pop more. Finally, I stamped the sentiment. Both stamps are from the Everything Resides in Hope stamp kit from Unity Stamp Company. I also inked the edges lightly with the black archival ink. I love his card! Super sweet and pretty design! What a perfect journal page. This sentiment is so true and we should all remember this daily. Beautiful work! so pretty I love all the colors you used. Lovely card. Love your background! Love the colors you choose here, and love that background! Beautiful work and so meaningful, Donna. This is so pretty. Each element adds a richness to the overall design. I love how the background looks. I never can get that right. You did an amazing job with the butterflies.